Here at Boxing Corner, we have designed our website to be as user friendly as possible. We are always happy to answer any questions that you may have about our website or our service, please do not hesitate to contact us before placing an order, if you have any concerns. The Boxing Corner name & logo are the Trademarks of the company. All other Trademarks appearing on our website remain the property of their respective owners. We reserve the right to alter any information on our website without prior notice. Boxing Corner reserve the right to refuse selling to any customer. All payment must be made in Pounds Sterling. 1. 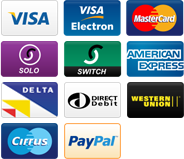 Payment can be made by Credit Card or Bank Account via PAYPAL. This is one of the most secure ways to purchase items through the internet Worldwide and will NOT cost the buyer anything. 2. Payment can be made by Cheques from U.K. Banks & by Postal Orders. Items will be dispatched once payment has cleared. Our address is on the invoice. Please Note....We do not accept Cheques or Postal Orders from outside the U.K. unless they are from a U.K. Bank / Post Office. All Items are sent via Royal Mail, First Class Recorded Delivery. You will be notified of the postal charges at the time of placing the order, All items are made ready for dispatch as soon as full payment has been made. Usually within 24 hours where possible. Please note that most deliveries are made during the working week and we would recommend that you use a shipping address , where there will be someone available all day, as all parcels have to be signed for. If you are not there to receive the goods, they may be returned to the sender and you will be responsible for re-delivery charges. We recommend that you take out shipping insurance to cover the goods, if the goods total more than £30.00. You can ask us to do this for you on the insurance OPTION section on the invoice. You will pay the extra cost as part of the invoice. The cost will be an additional £4.00. All Items are sent via Royal Mail, Air Mail. You will be notified of the standard postal charges at the time of placing the order. This may change due to the size / weight of the parcel to be shipped. We will confirm the actual cost as soon as possible via email and a Paypal invoice. We would need to see some identification that you live / work at the shipping address before shipping any goods outside of the UK. We recommend that you take out shipping insurance to cover the goods, You can ask us to do this for you on the insurance option section on the invoice. You will pay the extra cost as part of the invoice. The cost will be an additional £4.00. If you do not want to take out shipping insurance, we will post the items as soon as the invoice has been paid as per normal.. This extra insurance is recommended for all international shipping orders, but if the customer declines this extra safegaurd, Boxing Corner will not be held responsible for any losses what so ever. Boxing Corner reserves the right to alter any shipping costs as required. We will notify the customer of any changes via email. Delivery to non EU countries may incur import duties and taxes. Boxing Corner can not be held liable for any duties or taxes that are charged by Customs & Excise, or any Government import taxes whatsoever, this will be the sole responsibility of the customer to arange and finance any such taxes. The customer must email us immediately at sales@boxingcorner.co.uk to cancel an order, The order will be cancelled and a full refund will be given ONLY if the items have NOT been dispatched or bought in especially to fulfil this order. If the items have been dispatched and are a standard stock item, the goods must be returned, unused and in the original packaging within 14 days of dispatch from Boxing Corner. Upon inspection, If the goods arrive back within 14 days and are unused and still in perfect condition, We will refund the cost of the items only, Boxing Corner will NOT refund the cost that has been incurred to ship the items to the customer & back to Boxing Corner. All shipping costs must be borne by the customer. Boxing Corner accept no responsibility for goods that are damaged or lost if they are sent back to us. The customer will need to take out extra insurance cover at their own cost. Please insure you fully read and understand the returns policy before purchasing anything that you feel may not be the correct size for you. The shipping costs are always the responsibilty of the customer. Additional information for all custom made clothing. ALL garments that are manufactured with the Custom Clothing Company label must be taken to a professional dry cleaning company when they are due to be cleaned. Please take extra care with these garments and insure that the dry cleaners are fully licenced,insured and are experienced with washing these kind of garments before allowing them to wash your clothing. Do NOT iron any fabrics with sequins on. Boxing Corner and Custom Clothing Company are not liable or responsible for any issues that may arise after the garments have been washed in any way whatsoever..
All garments are made from top quality fabrics and are in pristine condition when they leave our premises. We at Boxing Corner check all items prior to dispatch for any defects and will guarantee that all items that are sent out, are of the Very Highest Quality. If you feel that an item is faulty you must contact us immediatley with the complaint. We will need the item sent back to us within 14 days of dispatch from Boxing Corner to inspect the alleged fault. If the complaint is upheld, we will offer a replacement item or a full refund for the original invoice price only, for the faulty item and original postage. You must produce a receipt of postage for a full postal refund when you send the faulty item back to us.